Cows are quite possibly the most important domesticated animal in human history, providing vast quantities of meat, dairy products, leather, and let's not forget manure for fertilizer. And yet DNA analysis reveals ancient humans almost didn't succeed in domesticating cows at all. There are about 1.3 billion cows in the world today. That makes just a bit of a change from 10,500 years ago, when the first population of domesticated cattle was likely just eighty head. That's the new finding from a team of British, French, and German researchers, who extracted DNA from cow bones found at an Iranian archaeological site that dates to not long after the domestication of cows. They discovered that the differences between these ancient DNA sequences and those of modern cattle were so minute that the only way to explain them would be if the original cattle population was extremely small, with about 80 cattle the most likely number. As the researchers explain in Molecular Biology and Evolution, since the domestication process was spread out over a thousand or so years, that's the equivalent of only adding two new cattle each generation. That's a recipe for astoundingly low genetic diversity — and yet it seems that pretty much every living cow can claim ancestry to those eighty cows and no others. It's a testament to how skilled ancient humans must have been at breeding cattle that the population survived and thrived the way it did, as these cows were effectively domesticated into an instant population bottleneck. To put it in perspective, one of their wild counterparts, the American bison, almost went extinct in the late 19th century, and its population never dipped below about 750, nearly ten times the founding cattle population. There are recent examples of species whose population fell below 80 — the European bison and northern elephant seal both dropped to just 30 — and even as their numbers slowly recover, they continue to teeter on the brink of extinction. Eighty initial cattle would have given their human breeders pretty much no margin for error in terms of maintaining genetic diversity, and yet the billion cows alive today reveal just how remarkably well they succeeded in growing the population. The fact that all cattle seemingly descend from a single domestication event is also unusual — for most other domesticated animals like horses or dogs, there's good evidence to support multiple domestication events, even if some lineages ultimately died out. But we know from the analysis of the ancient Iranian cattle bones that all cows throughout history likely only came from this one population. The reason for all this is likely that the wild ancestors of cows, known as aurochs, were nearly too wild to domesticate at all. Though the archaeological record makes it clear that aurochs roamed throughout Europe and Asia, it seems that either most domestication attempts failed or most people just thought the better of trying to tame these creatures. "Wild aurochs are very different beasts from modern domestic cattle. They were much bigger than modern cattle, and wouldn't have had the domestic traits we see today, such as docility. So capturing these animals in the first place would not have been easy, and even if some people did manage snare them alive, their continued management and breeding would still have presented considerable challenges until they had been bred for smaller size and more docile behavior." 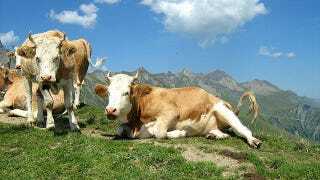 Part of the reason why only one domesticated cattle population emerged is possibly because of the particular requirements for the humans involved. Unlike, say, goat herding, the particular challenges of capturing aurochs and containing them would have been extremely difficult for hunter-gatherer societies, which represented the vast majority of human populations throughout Eurasia 10,000 years ago. The few sedentary, agricultural groups that had sprung up were the only ones even capable of bringing the aurochs in line. The management and subsequent domestication of these few wild cattle over some centuries could have been carried out by a small sized human group, like in a couple of small Neolithic villages. Importantly, the two sites showing the earliest signs of wild aurochs domestication – Dja´de and Çayönü – are less than 250 km apart. The closeness of these sites permits local exchange of wild / early domestic cattle management skills, and possibly the cattle themselves, and adds support to the hypothesis of a restricted origin of taurine cattle in the Levant. Interestingly, archaeological signs of sedentism during the 9th millennium BC are restricted to the same region (Cauvin 1994). It is conceivable that the management of wild cattle was too challenging for the mobile population of the surrounding mountainous areas where goat was the preferred domestic species. Another possible explanation for the low number of domesticated females is that the management of large, aggressive and territorial wild aurochs was too complex to be disseminated more widely before breeding for docile characteristics. The researchers also write that it's possible that other attempts to domesticate cattle may have been attempted, but these failed due to the difficulty of handling aurochs. Whatever the exact case, they conclude that "the low number of progenitors indicates that successful cattle domestication was a limited phenomenon in the Near East." It was by no means a certainty that cows were ever going to be successfully domesticated, considering just how tricky the task was. Of course, it's difficult to imagine the last 10,000 years of human civilization without cattle. Most likely, if this particular attempt to tame the aurochs had failed, another attempt would have been made, and eventually cattle would have emerged. Cows simply have way too many things to contribute to an agricultural society for them not to get domesticated sooner or later. But those eighty original cattle are a good reminder of just how razor-thin the difference between success and failure could be throughout human history, and just how brilliant and resilient our ancient ancestors had to be to successfully tame an incredibly wild beast, even if it meant a thousand years of work. Via Molecular Biology and Evolution. Image by viëtor on Flickr.